Stems: Erect to ascending, several to many, slender, branched at bases, densely short-hairy or nearly glabrous. Leaves: Alternate, simple, mostly sessile, linear to lanceolate or narrowly elliptic, .25 to 2.25 inches long, less than .5 inch wide, minutely pubescent; margins entire or shallow-toothed; tips pointed or blunt. Inflorescences: Racemes, spike-like, 2 to 16 inches long. 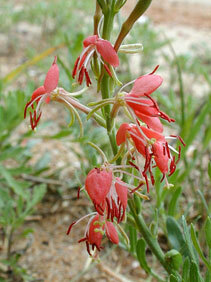 Flowers: Sepals 4, linear; flowers sessile, initially white, fading pink or red; petals 4, to .25 inch long, clawed; stamens 8, anthers yellow to red; stigma deeply 4-lobed. Fruits: Capsules, nutlike, cylindric, narrowed above; seeds 1-4, tiny, reddish brown. Habitat: Dry prairies, open wooded hillsides, roadsides, and stream valleys. Uses: The Lakota Sioux rubbed this plant on their hands to make them sticky to aid in catching horses, and the Navajo used a cold tea made from scarlet gaura to settle children's upset stomachs. Comments: Scarlet gaura forms colonies.